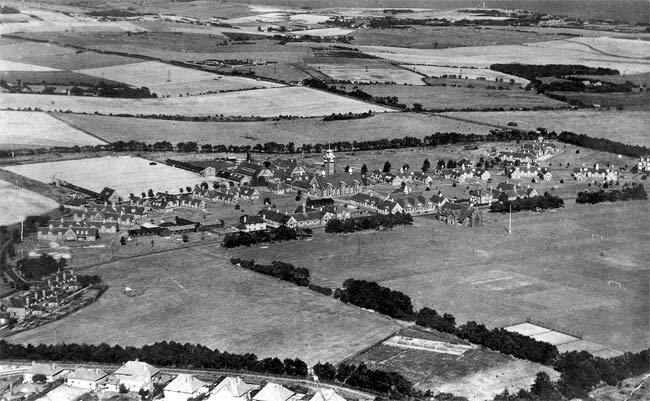 The school's photographic records would need to be consulted to be sure of the year that this aerial view of the premises was taken. Close inspection of a blown-up view provides enough evidence to suggest it was taken following the end of the Second World War before being handed back to the school authorities; almost certainly before September 1947. The Duke of York's Royal Military School, Dover. The most obvious indication of the year is the fire damage caused to Roberts House. The connecting structure between the wings had the most damage. The gable end to the left side of the building can be seen in the close-up view. There is a distinct change of colour to the roof tiling of the left side gable end. By the fall of 1947, the damage to Roberts House had not yet been repaired. Was the area where the cricket pavilion stands also damaged? Peter Goble, who joined the school in September 1947 has memories still of sneaking with Terry Smith through the hedge and gorging themselves on sandwiches near the pavilion (which is just out of the picture) in the summer of 1948, then re-arranging the plates so that the missing sandwiches would not be missed. Follow the road that begins at the left of the schoolrooms in front of the chapel. Located to the left of the quadrangle, a wooden hut is evident. It looks dark and sinister. In 1947 it either looks damaged or under construction. In the blow-up are to be seen two tennis courts (bottom right hand corner of the photograph) surrounded by high wire netting or fencing. A tennis net is also to be seen on the lighter patch to the left. It is highly probably, but not discernible in any enlarged view, that the darker patch to the right is equipped with a tennis net too. The two light patches of ground in front of the hedge that fronts the Padre's house are two long jump sand pits. Judging by the shadow cast by the flag pole behind the chapel, the image was taken towards midday. A pill box can be seen as a whitish spot to the left-hand of the long hedge. The entire grounds are deserted. No one is to be seen in the photograph, no grounds staff, no maintenance workers. Where is everyone? This image must have been before the school re-occupied the Dover premises or during school holidays. The entire panorama shows no signs of life. What could appear to be two cars parked in the hedge to the left an right of the chapel could in fact be two pill boxes. It is reasonable to suppose that this view of the school was taken from a reconnaissance flight to check on the state of the premises before handing them back to the school in 1945/6. Conclusion is that the shot was during or immediately after the war and before 1947. Note: Peter Goble provided this interpretation of the aerial view of the school.